The Pier Carioca is a travel, tourism and event agency totally focused on its tourist experience. We offer a wide network of services - such as safely and comfortably Shuttle Services, Accommodation in the best hotels, airline tickets, tours and many others - that allow us to efficiently support all your interests, whether individual or group. A pioneer on the segment of virtual travel agency, established in Brazil the concept of FIT customized travels, taking full account of your expectations. At this time, still with the name Carnival Service, an agency specialized in the Carnival of Rio de Janeiro, we acquired a know-how in all tourism segments that we operate today: leisure, business, tourism, aesthetic, cultural, corporative, among others. Whether on Emissive or Receptive market, we offer the most varied packages to major Brazilian cities or the world. Additionally, we have a vast expertise in Rio Carnival, offering quality services with unbeatable prices! We are always ready to assist you in planning your travel, from booking the flight until your return to home, so that you can make the most of your holiday or business trip. We are the first web-based travel agency specialized in Rio Carnival to be certified by EMBRATUR, the official Brazilian Tourism Board. This certification is your guarantee that our services are 100% LEGAL! We are a team of caRIOca (= Rio born) professionals who love Rio and its Carnival. We care for the city's good reputation and its tradition of warm hospitality. Our aim is to help you have a great - and safe - experience and come back next year. Enjoy Rio Carnival: have a great time and have it LEGAL! 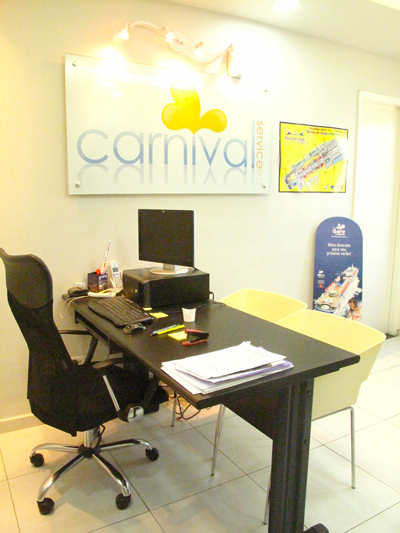 Stay with CarnivalService.com, the genuine SERVICES for your CARNIVAL IN RIO.